Things continued to look up this week. Mileage was on the grow and my legs are certainly starting to feel stronger. I continued to push both the weekday runs and the weekend long run. I know that you aren’t supposed to increase by much more than 10% over the week before, but when duty calls, you just have crank them out. Monday – 0 miles Rest Day. Tuesday – 7.5 Miles I created a new little route from my office through Rock Creek and down to my house. I hadn’t ever run this combination, and even though I was feeling really tired and slow, it was a nice run through the park. This was also the first really hot day of the year, something like 87 degrees and humid as all get-out. Wednesday – 7 Miles Stuck to the road, but broke free of my 16th St. rut, making a nice little loop up embassy row. Great run through DC. 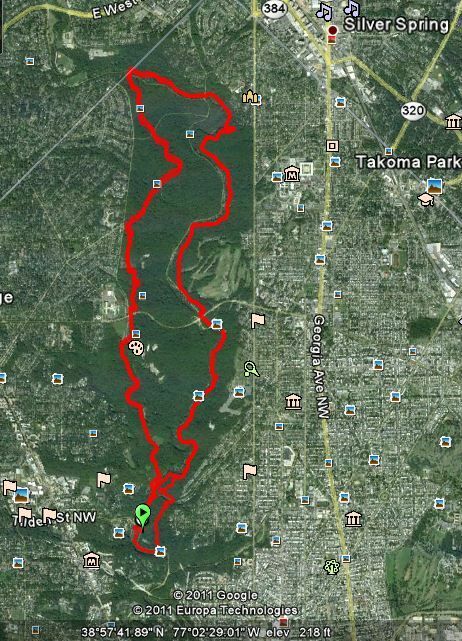 Thursday – 7.5 Miles This time I went back to my old MCM training route, the C & O canal. I’ve been avoiding it like the plague in recent months, mostly because of the awful memories I have of painful and humid runs from last summer. This was a much better experience. Friday – 0 Rest day at its best. A winning baseball game, a few cold Newcastles, and some salted peanuts. Saturday – 7 Miles Kept it slow and easy. The legs were feeling pretty good, but wanted to keep the heart rate low and legs fresh for Sunday. Sunday – 18.5 Miles A very solid long run. Jumping from 13 last week to over 18 this week might not have been the smartest thing, but I don’t really have any other option. I decided to drive down to Rock Creek Park instead of running in order to do the entire 18 miles on trail. I basically did two loops starting at the Tilden St. parking lot (at Tilden and Beach Dr.) and heading north up the Valley Trail. Once I reached Maryland (about 5 miles later), I turned around and headed south on the Western Ridge Trail. The first 2 miles of the Valley Trail are pretty technical, but the rest of the loop isn’t too bad. After completing the first loop, I hit up the car, switched out a water bottle and pushed on for round two. While low energy wasn’t an issue, I moved along a lot slower than expected, making this long run nearly 20 minutes longer than I had hoped. A lot of that probably came from the elevation changes. I’ve run both of these trails, and this loop, numerous times, but never at this distance. While I know what my trail pace is, I was still tempted to compare it to long runs on the road, which really threw me off. As you can see below, the loop is anything but flat, offering somewhere around 8100 feet of climb (same with decent…). elevation gauge really is, but it gives you a good idea of what I was faced with. Mileage Total: 47.5 Miles Just a bit short of what I would have probably done last week had I not had the setback. This coming week will look a little different, as KFB and I head to Atlanta to visit with my sister and mother for Mother’s Day. I’m planning to have a high workout/weekday mileage week with no major long run on the weekend. Back at it the following week with something in the 22-24 range for a long run before starting the final countdown. I know the trail you are talking about, but I haven’t ever been over there. I should definitely check it out. Maybe this evening? Thanks for the suggestion!